(1) He wears one Nike shoe and one Reebok. Not sure how common it is for someone to be wearing two different brands. 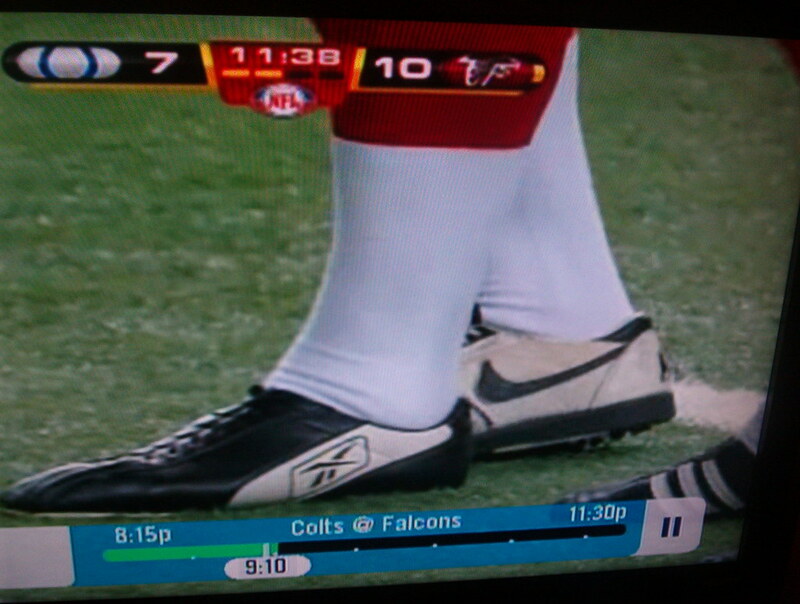 (2) The shoe on his kicking (left) foot was black, just like the rest of the Falcons. It was his plant (right) foot that differed from the rest of his team. Usually it’s the kicking foot that is “out of uniform” because the kicker is more comfortable with a particular shoe. That last bit is a genius observation. Why would Andersen need a special plant shoe? And why would it have to be white? And it’s not like this is his lucky left shoe that he’s been wearing for years, because he was wearing something else just last month. Weird. Meanwhile, several readers report that Dallas Clark of the Colts was once again playing without the American flag decal on his helmet last night. No visual evidence yet, but here’s a shot of a flag-free Clark from last week. If Clark’s flagless status from last night can be confirmed, that means our streak of at least one NFL player being sans flag for every week of the season remains intact. Uni Watch News Ticker: Bizarre story out of Tennessee, where a high school hoops team was cited for wearing illegal uniforms, resulting in 18 technical fouls being called. The resulting free throws were the deciding factor in the game. Details here. 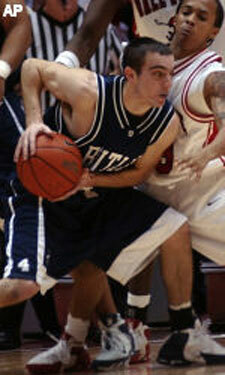 ”¦ More numbers on shorts: the Butler hoops team (with thanks to Mike Miller). 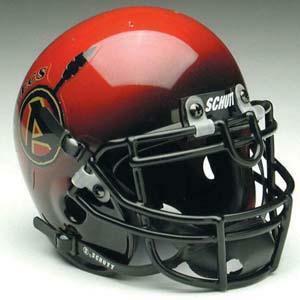 ”¦ While researching something else, I came across this awesome Cardinals helmet prototype on the Helmet Hut web site. ”¦ Latest chapter in the NHL jersey debacle here. 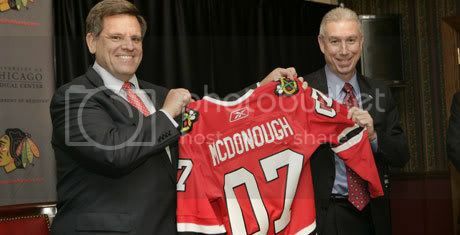 ”¦ When the Blackhawks introduced John McDonough as the team president, they gave him an honorary jersey. But David Soline notes that they didn’t use a lowercase “c.” ”¦ The Browns will be wearing their throwbacks this Sunday. ”¦ What’s the point of beach volleyball if you can’t wear a bikini? (With thanks to Jeremy Brahm.) ”¦ Todd Radom, Tom O’Grady, and I are all quoted in this article about the state of uniform design. 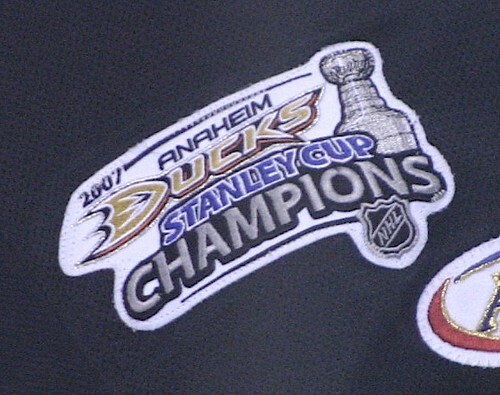 ”¦ Jim Pericotti reports that the Ducks’ AHL affiliate, the Portland Pirates, are wearing a Stanley Cup patch on the back of their jersey. According to the “18 free throws” article, there were actually 22 free throws as a result of the front numbers (or lack thereof), but 18 in the first minute-plus of the third quarter. Yesterdays Thankgiving day games had all of the teams wearing their current day uniforms. What happened? Isn’t Thanksgiving day somewhat of a throwback uniform day? i cant find a photo but i know clark wasnt wearing one…. It looks like Mort is using different plant shoes on different surfaces. The pic at the top is indoors on FieldTurf, but the linked pic (“just last month”) is to an outdoor game on grass. the outdoor pics of Mort look like he’s actually wearing a matching set of reebok cleats. Another case of non-matching numerals on the same team. You gotta love paying extra for networks on your digital cable service. 2. There’s a multitude of black and white stripes on their socks. Trust me, it’s worth the extra fiver per month to see this. Kicker J’s comments are right on the mark. I kicked as well, many times with different brands on each foot. Even when I was first starting out I knew the importance of a good plant foot shoe. And my steel-plated square-toed black Spot-Bilt kicking shoe was bought on the small/tight side (I wonder if that has anything to do with the state of my feet 25 years later!). Interesting that our team-issued shoes were almost the same exact style of Spot-Bilts, though when we wore white shoes my senior year, I stuck with two black shoes. 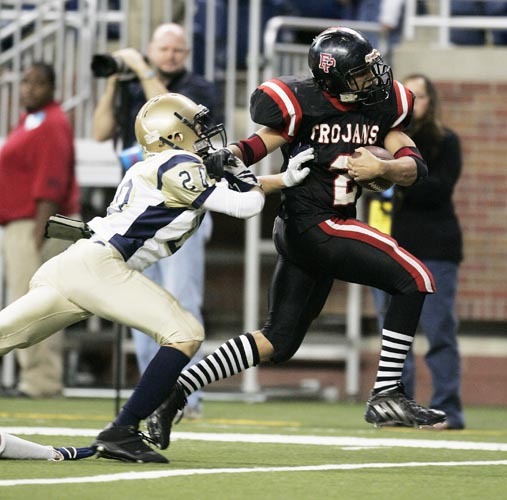 On artificial turf I wore a white turf shoe on my plant foot…and taped up most of my black kicking shoe to match. Morten rocks…I’m glad the Falcons keep bringing him back. Regarding Dallas Clark and his non-flag helmet, is it possible he switched to a different style helmet after he got a concussion a few weeks ago? This flag decal has not been there for two weeks, exactly the amount of time he is coming off of a concussion. Just a thought. As a former soccer player the first thing that I noticed was that the white shoe is a turf model. They have short little stubs on the bottom with about 50 little cleats. They are much more comfortable but not as tight of a fit, which can affect the kick. As they were playing on turn my guess is that he prefered the turf shoe feel but wanted the tight shoe on his kicking foot. If you go to a soccer shop you will notice that the soles of the shoes are completely different. Also, doesn’t the nike swoosh look drawn on? Carrying over from yesterday’s comments: The Falcons original colors were red, black, and gold to pay homage to UGA and GT. The first year helmet only had a tiny gold helmet stripe, which didn’t make it to year two. Rankin Smith, the original owner, was a big Georgia fan…and had a big impact on the Falcons colors. Anything’s better than their current unis! And now people wants the Orioles to return to their lovely “bird-head” caps, which I love. But when they had them, many were thrilled when they changed BACK to the “body-bird” caps. Pretty cool matchup between team names on Sunday, the Redskins vs the Buccaneers. The Bucs uni’s are ok with the flag logo on the helmet even though the original Buccaneer was better. It would be pretty cool to watch an animated Redskin in battle with a Buccaneer..helllo Hollywood. I’ve always drempt of creating an animated version of a battle between team names. Also good team name matchup would be a Giant vs a Viking..in purple of course..
… and to add to my comment, if it is indeed a new helmet, that is why it could be flag-free. Maybe no one put the decal on when he switched helmets. Just thought I would clarify that up a bit. Nebraska in all white today against the Buffs all-blacks. some look ok, some look like all white one-sies. From a Nebraska fan, not a very good look. It looks okay, but just not like Nebraska, if you know what i mean. Although I doubt the good people at Florida State University had them in mind when they designed their all black unis, there is a historical precedent for them. The Black Seminoles, often overlooked and seldom taught. I teach high school history in Florida, and covered them a few weeks ago. [quote comment=”175944″]Yesterdays Thankgiving day games had all of the teams wearing their current day uniforms. I noticed this as well. Even with six teams playing instead of four, no throwbacks. I feel like that was a first for at least a decade… can anyone back that up? Penn State has the best…!!! [quote comment=”176000″]Although I doubt the good people at Florida State University had them in mind when they designed their all black unis, there is a historical precedent for them. The Black Seminoles, often overlooked and seldom taught. I mentioned this just now in yesterday’s thread, but the black ‘Noles unis were worn to honour the Seminole tribe. I don’t know if that’s why they chose black (probably not), but I suppose it may be. That is why the pant leg says “Unconquered” (unfortunately, the ‘Noles lost the one game they wore them). All white for the huskers today… not a good decision. Neither is putting those shoulder numbers way too close to the sleeve stripes. Just looks a bit crammed on there. I read the article accompanying the pic of the prototype Cardinal helmet, and was surprised to see the Dallas Cowboys left off of the short list of non-uni colored facemask teams. The standard color facemask back in the day was a light gray which looks similar to the Cowboy silver, perhaps, but it is not the same. Some Cowboy replica helmets have been spotted with dark gray or even blue masks, but the ‘Pokes have never worn them. It’s nice to see I’m not the only kicker (former) that reads UniWatch. J is right on with his assessment. Playing 95% of my games in California and only one on AstroTurf I did not need to wear different shoes very often but when it did rain I often wanted a longer cleat for peace of mind. Nebraska hasn’t looked like Nebraska for a long time, if you know what I mean. hmm… Apparently FSU did bust out the blacks a second time, for Duke this year. Much easier to conquer them, I guess. Also, to the person who mentioned the uniform looked green-y in the mock-up photo (the most circulated image of the uniform), note that the real thing is actually just black. I love the monochromatic Nebraska-Colorado game. You know, over the summer and in the early fall, I couldn’t understand why everyone hated the Islanders’ new sweaters so much… I thought they looked ok. I just turned on the B’s game vs. the Isles, and yeah, those look terrible. I’m happy for Deleware State to finally get a crack at their recalcitrant neighbors. Unfortunately for them the outcome doesn’t look too good and their school gave them what have to be the most generic helmet’s ever. Dallas had no flag for the Panthers game either. Here is a pic of Dallas w/no flag last night. Better picture of a flag-less Clark. As a Cornhusker, I am not happy with the all-white. Objectively, it looks fine, but I feel like I’m watching Wisconsin. In sum, the Cornhuskers pants should be red on the road, but they should not be the modern shiny material. Oh, and CU’s black-over-black looks as ugly as ever. They look great in their black-over-gold, and need to stick with it. Oh, and the missing flag can’t be due to wearing a different type of helmet, as Clark has always wor the Revolution style helmet. also, in that article, it says that PL said this. In fact, “older teams [like the NFL’s Cleveland Browns] tend not to mess around as much,” says Lukas. Newer teams, he says, especially ones formed in the past 15 “era of merchandising” years, haven’t established an aesthetic heritage, and perhaps never will. please tell me that it was the author and not you that suggested that the cleveland browns are one of the older teams in the league. the cleveland brown franchise is the second newest in the nfl (next to houston) and is currently playing their 9th season in the league. C for captain I assume. [quote comment=”176035″]also, in that article, it says that PL said this. According to the NFL records, the Browns went on hiatus for three years and a new franchise, in Baltimore (owned by the previous owner of the Cleveland franchise), inherited their player/personnel contracts. Technically, the Browns are still the same franchise that started in Cleveland in 1946. Technicalities aside, the “new” Browns did take on the traditions of the “old” Browns, including their uniforms. Are kcikers and punters also exempt from the “Only Reebok or Nike logos” rule as well? I ask because you can plainly see the Falcons punter, Michael Koenen, wearing a pair of Adidas, with the 3 stripes plainly visible. Watching the LSU-Arkansas game, and even in the bright sunlight, the stripes, letters, and facemasks on the LSU helmets still look black. I know it’s a dark purple, but it still looks black. And I’m still somewhat surprised that the LSU helmet letters and logo are of the same type as they have been since the late ’70s. I almost expected the letters and tiger head to match that of the “official” LSU athletics logo. Duh. Of all the teams to choose to put into a bracketed insertion, I can’t believe that’s the one he chose…. The Delaware-Delaware St game looks like a faded Michigan vs hand-me-down Fresno St. While watching the Cowboys Jets game last night, I noticed what seemed to be differing sock styles among the officals. One offical seemed to have a different sequence in sock style. Maybe I only caught a glimpse of it, but I’m pretty sure it was different. Also I apologize I don’t have a screen shot and I’m fairly certain it was the Cowboys Jets game. That is correct. It is a cool touch to put the captain’s “C” into an existing patch worn by the rest of the team. Oakland University has apparently gone System of the Dress or whatever. Names still below the number on the back. They look ridiculous. Yeah about that rule , do mario williams and reggie bush get fined every time they shoe their logos because i’ve clearly seen the adidas stripes on their cleats numerous times. They had Cartman (in CU jersey) introduce the Buffs today. Colorado looks great. Nebraska, eh, not so good. Red pants look better on the road. But hey, I’m a guy who never likes to see the same combination in the same season twice, so I like that Nebraska tried the all-whites out. Texas A&M, who normally wears all maroon against Texas, broke out the gray/silver pants today, and boy do they look great! Not as good as all maroon, but still very nice. I always wondered if South Park was Buffs or Rams Country. During the broadcast, they said that the duo behind South Park attended CU. Adidas and Under Armour cleats (as of last season, I believe) can be worn on field. Nike and Reebok are the others. You may remember that Reggie Bush did get fined each week until adidas signed a license agreement with the NFL. According to Bush, adidas “took care of” the fine. I plead ignorance here so if anyone can help, please come to my rescue. My question is the player on the left has an insignia on his jersey, and it certainly is not a “C” so I was wondering what that patch (image) is? Nor do the Blackhawks put an “0” in front of any of their single digit numerals. Obviously, the jersey is not intended as an official “EDGE” uni, but just a visual prop to bring on John McD from the Cubbies. [quote comment=”176112″]I plead ignorance here so if anyone can help, please come to my rescue. That’s the WWW patch, in memory of William W Wirtz, the late owner of the Blackhawks. With all due respect to Mr. Wirtz, the entire Wirtz family and the Blackhawks organization, Bill’s passing is actually a “phoenix” for professional hockey in Chicago. The announcement of Rocky Wirtz as CEO, the hiring of John McDonough (from the Cubs) and having actual Hawks home games on Comcast supports that theory. I made that same statement either yesterday or the day before. For all Mr Wirtz did to make the Blackhawks what they once were, he also held them back quite a bit. It is worth noting that quite a few teams established within the past 15 years (Marlins, Rockies, Jags, and Panthers) haven’t had any substantial uniform/logo overhauls during their existences. Of course, then you have the Coyotes, who have radically overhauled their logo, and the Rays, who changed mascot, logo, and colors. But all have given into the dreaded alternatve 3rd black jersey (Panthers started with black) but use the blue quite a bit too. Black jersey = merchandise ploy. Nothing more. Arkansas has a ton of decals on the back of their helmets. anyone know what boise state’s ian thomas’ ode to rolling rock is all about? Just turned on the Tenn/WVU game and the yellow vs. orange is tough on the eyes. I think the deal was, Adidas bought Reebok, thus inheriting the license, so they can put both of their brands on the field. Boise State @ Hawai’i, the names have returned to the backs of the Broncos’ uniforms. Did they return earlier this season, or is this a one-game thing? [quote comment=”176158″]Arkansas has a ton of decals on the back of their helmets. I noticed that too. But they were all small enough so that the helmet didn’t become too crowded. Refering to the Tennessee and West Virginia bb game. What is the rule on wearing yellow as an alternate jersey? I’m just taking a shot in the dark here, but I think that gold is considered a “Home” alternate color, since it’s closer to white than it is to black in hue. If it were “Old Gold” (like if Notre Dame were to go gold) it would be a “road” color. I think the only steadfast rule in college sports is “don’t wear the same color as the other team”. Didnt the Jags change their logo after their first season? I thought I remembered something about them having a leaping full body Jaguar logo on their helmets but being forced by Jaguar (the car company) to change it. Just noticed this myself near the end of the first half. They’ve been on ESPN or ESPN2 a few times this season and this is the first time I’ve noticed the named on the back. Thankfully they’re not wearing those orange pants. Look at the helmets on the Gameday set. The Kansas is the old navy blue they wore from 02 to 05 with the navy mask. They are the light blue now with the grey mask. ESPN just put the new decal on the old helmet! I think LSU implements purple incredibly well. [quote comment=”175967″]You gotta love paying extra for networks on your digital cable service. Sorry about the italics! I didn”t like the Hogs tall white socks with their white pants. Reggie Wayne is wearing the Air XP like Julius Jones of the Cowboys. And check out the defender #21 in post 79. He is wearing metal baseball spikes, check out the glove of the kid whose finger he damn near stepped on. By the way, why was LSU wearing white at home? COme to think of it, you rarely see the Bayou Bengals in their purple jerseys. Sorry…I messed up the italics! I really do have some original thoughts. I noticed that too. I know KU isn’t a traditional power, but you’d think ESPN could pony up the cash for a new helmet. At the very least they could’ve just rebadged a Giants helmet… the would’ve been close at least. I was at my high school’s football game tonight and said “It bothers me that not everyone on the team has matching socks”, and my friend next to me looked at me like I was crazy and asked if I had OCD. Teams actually send ESPN the helmets. I remember last year an IU player got a helmet sticker on gameday final and they had an old IU helmet from the Cam Cameron era and Rece Davis made the comment Indiana needed to send them a new helmet because they didn’t have a new one on hand. Did anyone catch a look at Ole Miss’s uniforms today? They are absolutely terrible. They look Jr. High low-budget-ish. Nope, those are the Jordan Mach3 cleats. Made by Nike/Jordan exclusively for football. Maybe the cleat is silver, but the Mach3’s were never produced as baseball spikes. Good call…Now that you mention it, I remember those. They also had a turf version similar to the Mossifieds that Randy Moss wore.